This tiramisu recipe is absolute heaven! Made the classic Italian way, with mascarpone, espresso, and marsala wine. So fluffy, creamy, and full of rich flavor! 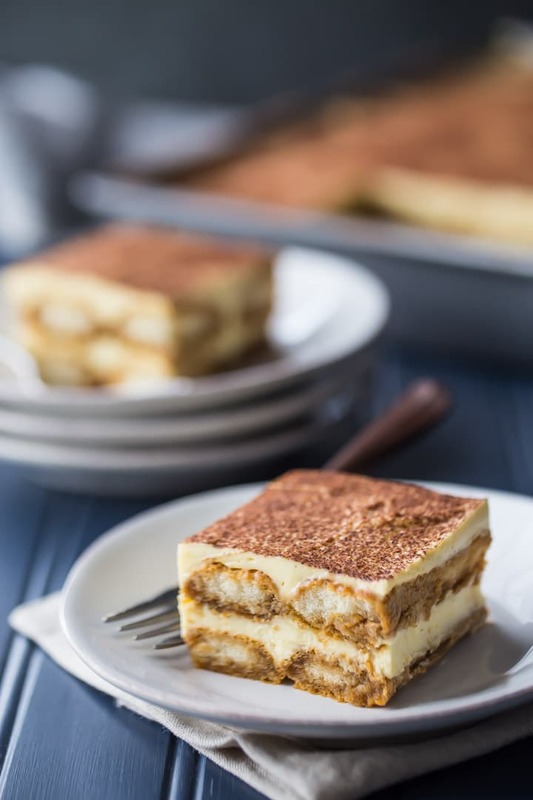 Tiramisu is one of those classic desserts that is so beloved! I know a lot of people who utterly cannot resist it when they see it on a restaurant menu. I love making tiramisu because it’s so easy, you don’t even have to bake it. And it serves a big crowd, so it’s perfect for parties and pot-lucks. Plus, because of the fancy-sounding name, people are always so impressed with it! If you check online, you’ll find TONS of different tiramisu recipes, and the ingredients are all over the map. Different recipes call for different kinds of liqueurs. Some call for instant espresso, and some call for the real brewed kind. Some tell you to use cream, while others recommend egg whites. Some don’t even have any eggs in them at all! DOES TIRAMISU CONTAIN RAW EGGS/? I like to use eggs in my tiramisu recipe because it’s authentic. They also give a richness, and a light airy texture that I really don’t think can be replicated any other way. But I do prefer to cook them. As I’m sure you know, if you eat raw eggs there is a very small chance of salmonella. But the main reason I recommend cooking the yolks over a double boiler is because they will become so luxuriously thick and airy. It also helps to dissolve the sugar, so your tiramisu filling will be incredibly silky-smooth. Just whisk your yolks, sugar, and Marsala wine together in a bowl placed over a small pot of simmering water. After about 5 minutes, you’ll notice the mixture becomes noticeably different. It will go from being just a little foamy on top to whoa! Almost mousse-like, very thick, pale, and doubled in volume. Guess what? You just made zabaglione. Besides being the base of tiramisu filling, zabaglione is also another traditional Italian dessert! It’s great just eaten with a spoon, or even better spooned as a topping over fresh fruit or cake. 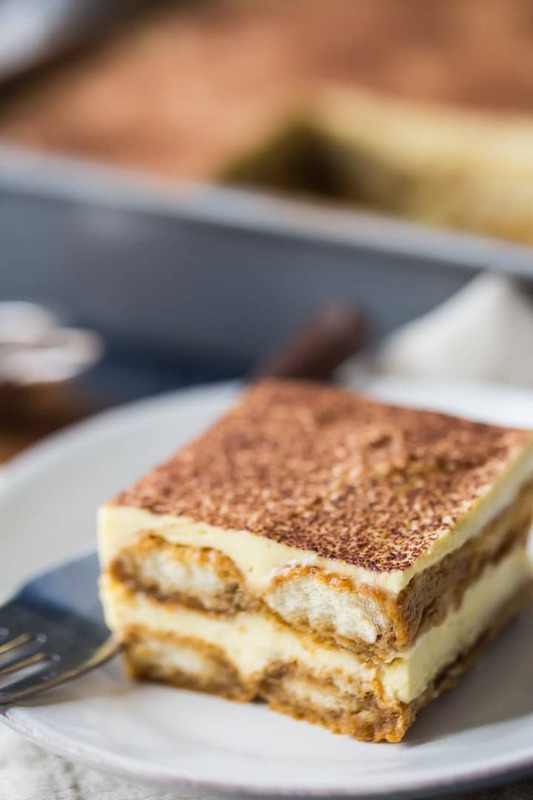 Traditionally, tiramisu is made with Marsala wine in the filling, and the ladyfingers are soaked in a boozy coffee mixture. The Marsala wine gets cooked over a double boiler, along with egg yolks and a little bit of sugar. I think that most of the alcohol is probably cooked out. You are left with just the flavor of Marsala. Marsala is a fortified wine from Sicily, similar to Madeira or Sherry. It often has a caramel-y flavor, with notes of apricot, vanilla, and tamarind. As for the boozy coffee that the ladyfingers are soaked with, that is not cooked. The alcohol in that mixture is definitely present, and it gives a nice warmth at the back of the throat. I don’t think there’s enough alcohol in this tiramisu to get anyone buzzed (only 3 tablespoons of liqueur for 12 large servings), but if you want to make a non-alcoholic tiramisu, just leave the liqueur out, or sub with fruit juice or additional espresso. If you enjoy a boozy treat once in a while, you can use any kind of liqueur that complements coffee well! I’ve seen tiramisu made with coffee liqueur, brandy, rum, Irish cream, hazelnut liqueur, and the list goes on. Coffee liqueur (aka Kahlua) is my favorite choice, but you can use anything you like! WILL TIRAMISU KEEP ME AWAKE? If you soak your ladyfingers in caffeinated espresso, it could! 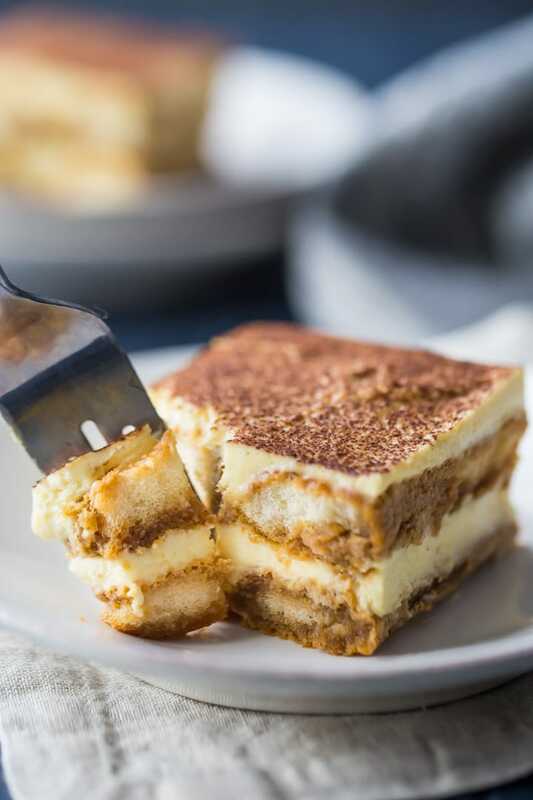 The word “tiramisu” is Italian for “pick-me-up,” so it definitely has the reputation for putting a little extra pep in your step. Personally, I am very sensitive to caffeine, so I choose to use a decaffeinated espresso. I have an espresso machine that uses pods. It took 4 pods to make enough espresso to soak all 48 ladyfingers. If you don’t have an espresso machine, you can purchase brewed espresso at a coffee shop, or use instant espresso powder mixed with hot water. There’s a link to my favorite instant espresso just above the recipe card below. The flavor is rich and full, and I always keep a little jar on hand for any kind of coffee or mocha flavored treat I might want to make. You might also want to check out my chocolate tiramisu, for a completely caffeine-free and non-alcoholic version that the whole family will enjoy! WHAT KIND OF LADYFINGERS SHOULD I USE? Look for Savoiardi. This is what is traditionally used in tiramisu. They’re light and very dry, so they will soak up the liquid well. Sometimes I can find them in the gourmet cookie or Italian section of my supermarket; sometimes I have to order online. Look for a link below (just above the recipe card), to the exact brand I used for the tiramisu you see pictured here. You can also make homemade ladyfingers! Check out my homemade ladyfingers recipe, if you really want to be a superstar! Just leave them out (uncovered) overnight so they become crisp. I’ve definitely seen the case made for no cream in tiramisu. Some people say it’s more authentic that way, although I’ve enjoyed tiramisu in Italy that I’m sure was lightened with whipped cream. I prefer tiramisu with whipped cream because it builds it up and makes it more fluffy and light. It also helps the squares to hold together better. And it makes it last longer, without weeping or deflating. If you want to leave out the cream that’s no problem. You can leave it out entirely (your squares won’t be quite as tall), or replace it with 4 egg whites, beaten to stiff peaks. Mascarpone is a soft, creamy cheese that’s made in Italy. It’s very similar to American cream cheese, but without the tangy flavor. It’s found pretty easily in the cheese section of most grocery stores. If you’re looking to make a substitution, cream cheese is probably the closest thing. But it will yield a slightly different flavor, and not be as authentic. 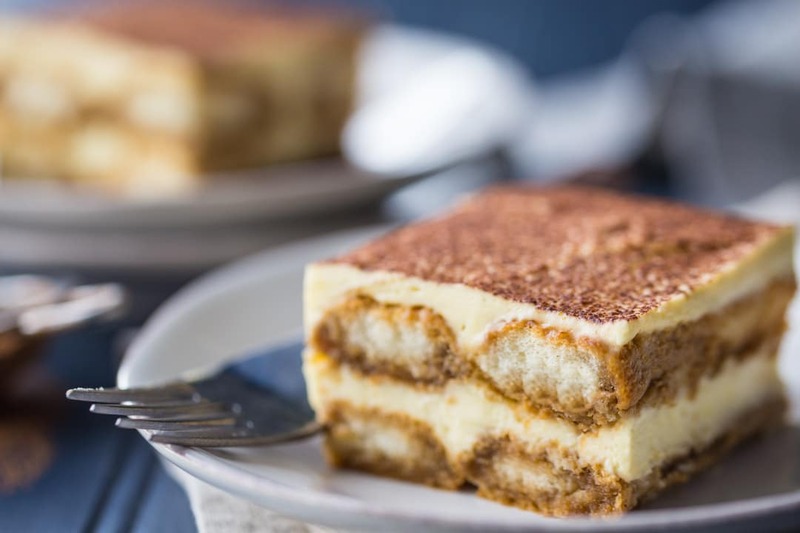 Tiramisu is all about the mascarpone! Allow your mascarpone to come to room temperature before whisking it into your zabaglione. It might take a little elbow grease, but you can get a nice smooth filling, with no lumps, by just whisking vigorously by hand. That is one of the best things about this dessert! It’s gets better the longer it sits. I would recommend making tiramisu the day before you plan to serve it. This way, all the flavors have a chance to meld, and the ladyfingers become pillow-soft. If you make this tiramisu recipe as written, it should keep in the fridge for up to 5 days, but it’s definitely best the day after it’s made. Looking for a layer cake version of tiramisu? Be sure to check out my Tiramisu Cake! Place the egg yolks, sugar, and Marsala in a large metal mixing bowl, and set it over a pot of simmering water. Remove from the heat, and whisk in the mascarpone. Whisk the espresso, liqueur, and powdered sugar together in a shallow dish. Spread half the filling over the ladyfingers, and repeat. Spread the rest of the filling on top, dust with cocoa powder, and refrigerate for 8 hours. *Or 2 cups hot water mixed with 3 tablespoons instant espresso powder. For a non-alcoholic, caffeine free version, try this Chocolate Tiramisu. For a layer cake version, try this Tiramisu Cake. Tiramisu is such a lovely treat! I love tiramisu and you’ve made it exactly the way I like it!! Perfect layers, perfect recipe. Can’t wait to try it! Hi, Allie. This looks so amazing. I’ve been wanting to make tiramisu for a long time. I’d like to try this recipe. Do you know if one package of the Savoiardi ladyfingers is sufficient for the recipe? Or do you need 2 packages? It doesn’t list on Amazon how many of them are in the package. According to your instructions, you use 24 for each layer. It would be just my luck to buy a package & it wouldn’t be enough. Do you know if they sell these anywhere else besides Amazon? Do grocery stores carry them or do you have to go to a specialty store? Thanks so much for any help you can give me. Hi Sandy! The brand that I linked to comes in a 400g package, and that is enough for one pan of Tiramisu. Sometimes I can find them in my grocery store but sometimes I don’t have the best luck and I have to order them. Hope that’s helpful! Thanks so much, Allie. Good to know that one package is enough. I’ll look in my store, but I doubt they’ll have them. I’m glad that they can be ordered online. Much easier than running all over looking for them. Sorry to bother you again with another question, but is the instant espresso coffee that you show above the recipe, the same thing as King Arthur Flour’s Espresso Powder? I’ve seen the latter listed in the ingredients in a number of different recipes, & I’m thinking they’re not quite the same thing. Thanks again. No problem Sandy. I’ve never used the King Arthur brand, but if they’re calling it instant espresso powder then I would assume it is the same thing. Good luck and have a great day! Thanks so much for your help, Allie. Can’t wait to make this someday, as soon as I can gather all the ingredients together. I’ll let you know how it turns out. Have a great day! Sounds great Sandy! I’d love to hear how you make out. Thanks so much! Cannot wait to make this! It doesn’t say…When do you add the Marsala wine? Also do you think it would be OK to add whole eggs instead of only yolks to make it lighter? Hey Amy! The Marsala gets whisked in with the yolks and sugar. And there’s info on using whole eggs under the heading “Should Tiramisu Contain Cream?” “If you want to leave out the cream that’s no problem. You can leave it out entirely (your squares won’t be quite as tall), or replace it with 4 egg whites, beaten to stiff peaks.” Hope that’s helpful! The ingredient list calls for 1/3 c. marsala wine, however it does not mention when to use it in recipe. Sorry for the omission! It’s all fixed now. The Marsala goes in with the yolks and sugar. Thanks for the heads up! This is the perfect tiramisu! Tiramisu is one of my favorite desserts! This one looks so delish! Thanks Zainab! We don’t eat it often, so when we do it’s always a big treat! Allie, I absolutely love Tiramisu! Your photos look so gorgeous! The soaked ladyfingers and the creamy layers are making me salivate! So great to hear from you Samina! It’s been a while- hope you are well! Thanks for the sweet compliments! Hi! Number 5 in the directions says to fold whipped cream into the marscapone mixture, but whipped cream is not an ingredient and the marscapone mixture is already whipped into stiff peaks in number 4. I’m making this today and don’t want to mess it up, haha! Hi Victoria! The ingredient list calls for 1 cup heavy cream. Step 4 in the directions is to whip the cream to stiff peaks. Step 5 is to fold that whipped cream into the mascarpone mixture. Hope that clears it up for you! Good luck! Hi I am making tiramisu from a recipe I received from someone in Italy. I want to try your step of cooking the egg. I don’t want to use Marsala wine in the recipe. Do I just omit it completely or should I compensate it any other way? I’m afraid I can’t really answer your question- I don’t know anything about the recipe you’re using. So sorry! love this, looks yummy and amazing. Hey Chris! 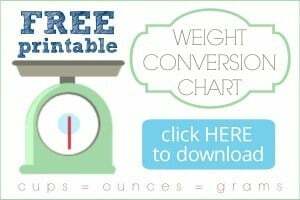 You can use whichever you have on hand. Either kind will work, it’s just a matter of personal taste. Hope you enjoy! This looks sooooo good! I’ve never made tiramisu…. can I use electric beaters to whisk the egg mixture and then the mascarpone, or is a regular whisk better? Which particular Marsala did you use? I’m planning on making it for a dinner party with 30 people this weekend – yikes! So please wish me luck! Hey there! So happy you like it. You can use an electric mixer or whip by hand- it’s up to you! I just used a regular Marsala wine. Good luck I hope everyone enjoys! You’re right , there’s tons of tiramisu recipes out there. I made this one and i thought it was perfect. When I searched for it because I’m making it again (it’s been a week) I couldn’t find yours in the heaps of pages. I searched “Allie and tiramisu” and here it is. Thank goodness And thank you for sharing. So glad you were able to find it again! Hi Allie! Would you have any recommendations on what to replace the wine with or should I just leave it out completely if I don’t want to use that? Also, how long should the lady finger be in the coffee? I just made a recipe, not traditional at all more of an “easy” one I guess, but I believe I dipped the lady finger stop long! Excited to try your recipe, my fiancé loves this! Hey Maggie! You could either sub it with water or you could use more espresso. Totally up to you! If you run out of coffee then you may have dipped your ladyfingers a little too long, lol! I usually give them a couple of seconds on each side. Hope that’s helpful! And hope you and your fiance enjoy! PS- If you’re interested in a non-alcoholic and caffeine-free option, you might like this recipe: Chocolate Tiramisu. Hi, Can you link the marsala wine you used? I tried making it today but it didn’t quite workout. If anything, can i substitute the marsala with something else to just not use it? Hey Ella! I’m so sorry to hear you had trouble. Can you be a little more specific as to how exactly it didn’t work out? I’d like to help troubleshoot. Is there any way to save it if the mixture is runny? I think the egg yolk and marsala wine part didn’t get think enough (wisked about 5 minutes longer to try to get it thicker). Hey Katie! So sorry you are having trouble! I’m not sure which step you are on, but if the mascarpone hasn’t been added yet, you can keep cooking the yolk mixture until it’s properly thickened. Good luck! I would like your recipe for the lady fingers,Allie. Can’t get them from our only supermarket in a country small town. Please help! Your tiramisu recipe said it was below but I never found it. Duh!!! No problem Terry! The recipe you’re looking for can be found here: https://bakingamoment.com/homemade-ladyfingers/. It’s also linked in the last paragraph below the heading “What kind of Ladyfingers should I use.” Hope you enjoy! I don’t have marsala. Can I sub sherry? Hey Dale! Marsala is more authentic, but sherry does taste similar so I think it would work in a pinch. Good luck & I hope you enjoy! Hi Diane! It’s best to keep it covered so it doesn’t dry out or pick up any funny fridge odors. Hope you enjoy! 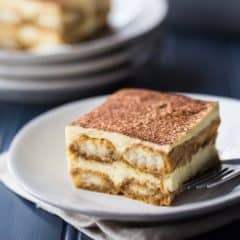 Allie, I wrote last week about making many batches of your Ladyfingers recipe, to prepare for a large batch of Tiramisu at the private lodge where I bake desserts. 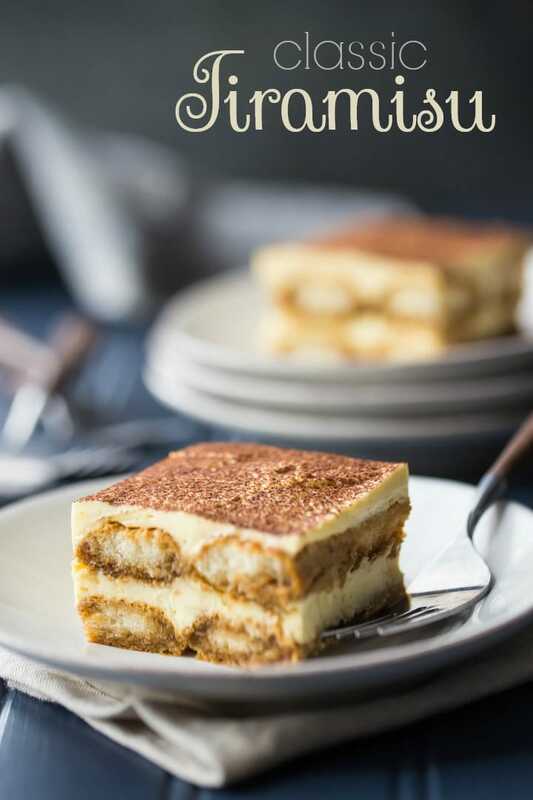 Thank you so much for this Tiramisu recipe, I’ve now made it twice and my Chef boss (world-traveled) honestly critiqued it, and pronounced it ‘balanced and very good’ which is a stunningly awesome and positive comment from him! 😀 I made it in a hotel pan. The first time, I doubled the 9″ x 13″ proportions and it was fine. But today I decided to triple that formula for the hotel pan and I am more pleased with the outcome. Your step-by-step directions gave me confidence and now I consider this a permanent fixture in my repertoire. Thank you so much! That’s such great news HollyRae! I love that you’re tripling the recipe- more is always better lol! Thank you so much for letting me know how it’s worked out for you. I hope your Chef boss gives you a big raise! I just attempted your tiramisu recipe and the filling got lumpy when I added the mascarpone. I was wondering if you let the mascarpone get to room temperature before you start mixing everything together? Also, do you have any other tips on avoiding lumps? Thanks you so much! Hi Ashley! It usually does start out lumpy but the more you whisk it should come together. It does help if the mascarpone is not cold. And cream will always whip up better if it is cold. Hope that’s helpful! Hello! I’d love to try your recipe for tiramisu but I won’t be able to get the Savoiardi ladyfingers by time I need to make it. Would another brand of ladyfingers be ok? Hi there! You can use any kind of ladyfingers you like. The drier the better! You could also make homemade ladyfingers and just let them sit out and get stale: https://bakingamoment.com/homemade-ladyfingers/. Hello! I am so excited to try this recipe for my birthday! I do have a question about using a metal mixing bowl; is the goal to have a double-boiler, and would a glass bowl work as well? I don’t have any metal ones and am hoping that I can still make a egg yolk/marsala mixture without one. Hi Grace! Yes the idea is to create a double-boiler effect. You can do it with a glass bowl, but because they are thicker they will take a little longer to warm up. Good luck and happy birthday! The tiramisu was a big hit. I also used your ladyfinger recipe! I made three desserts for my party and your tiramisu was the first one finished! Thanks so much. That’s so great to hear Grace! I’m so happy everyone enjoyed. Thanks so much for letting me know! Making this today for a dinner party tomorrow! Do I soak both sides of the ladyfingers? Or just one? It doesn’t really matter. If you want more coffee flavor then do both sides. Up to you! Do you think I could skip dusting the cocoa on top & freeze the tiramisu then, after it’s been thawed,dust it with cocoa once I want to serve it? Hi Zainab! To be honest I am not 100% sure. Sometimes the freezing/thawing process can cause soft cheeses to become a little grainy.